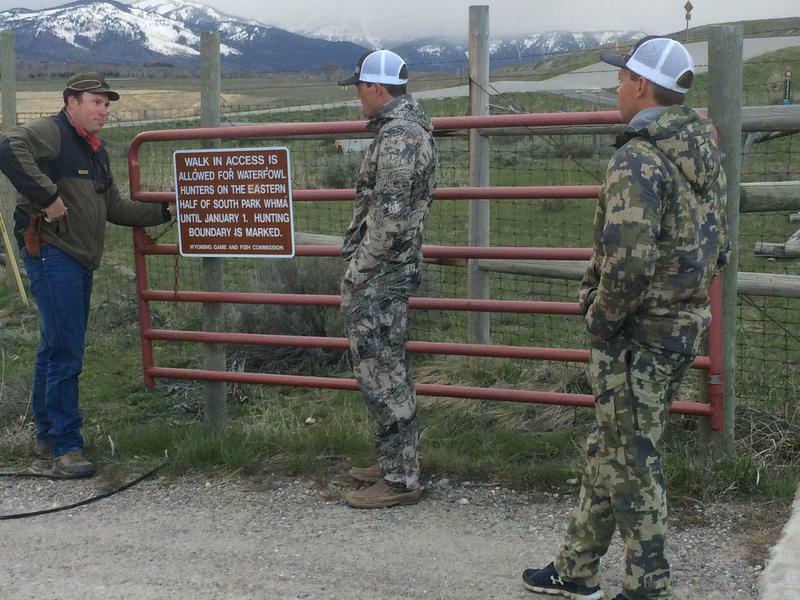 It’s six o’clock in the evening on what may be one of Wyoming Game and Fish Game Warden Kyle Lash’s busiest nights of the year. He parks his truck and pulls out his binoculars. He just got a call reporting that some people with backpacks and binoculars were spotted hiking into an off-limits wildlife wintering area. He shows me the area on the map. “See all the dark purple? Those are actually our winter range areas, an area that’s designated where elk and deer and any local wildlife would kind of be wintering. Those are closed off from, oh, December 1 to April 30 and then tonight at midnight they’ll open up,” Lash says. In the winter, people can’t enter this area because wildlife need these slopes where the snow melts off and they can graze. Lash says when people sneak into them, animals hide in the trees where they can’t dig through the snow to eat. Lash says that’s especially true this year. “We had an extremely difficult and hard winter here in Jackson,” he says. And that means antler hunters are likely to find lots of valuable dead heads, antlers still attached to the skull of a dead animal and their worth big bucks—excuse the pun--to antler buyers. And so, tonight, the temptation to get out onto those winter ranges is fierce. It even drives people to poaching. Last year, the Game and Fish apprehended some of the biggest antler poachers and slapped them with steep fines as high as a thousand dollars. But for guys like Don Hoarder, $1000 doesn’t compare to how much he can make picking up antlers. It’s now around 9 o’clock, it’s drizzling, and Hoarder is sitting in a line of trucks, waiting at a winter range gate for midnight. Hoarder doesn’t just collect antlers; he buys and sells them too. Hoarder knows a guy who made $30,000 in two months picking up antlers. He says right now, the market can’t get enough antlers. He sells the best chocolate brown ones for chandeliers and furniture in Jackson. The white ones are used in other ways. In Asia, antlers are ground down and made into a gel that people consume to increase their virility and sports performance. Now, it’s 11 p.m. at night. Hundreds of trucks and horse trailers are lined up at the national elk refuge gate, all the way back to the Jackson town square with its famous antler arches. Trent Purser drove here from Idaho. He says he has no plans to sell his antlers. Purser says he wishes Wyoming would just sell an antler hunting permit and put an end to the craziness of opening night. And it is crazy. Two years ago, a boat capsized and a horse was killed crossing the Gros Ventre River on opening night. But when midnight arrives, the Elk Refuge opens its gate and streams of vehicles drive through to reach the Shoshone National Forest on the other side. But Iverson says there’s no stopping on the refuge allowed. It’s illegal to pick up antlers here. She says their staff and a local Boy Scout troop pick them all up instead. And then at the end of May, the refuge hosts an antler auction on the town square. The deadheads and antler pairs sell for hundreds of dollars. But bidders also buy white antlers by the truckload. 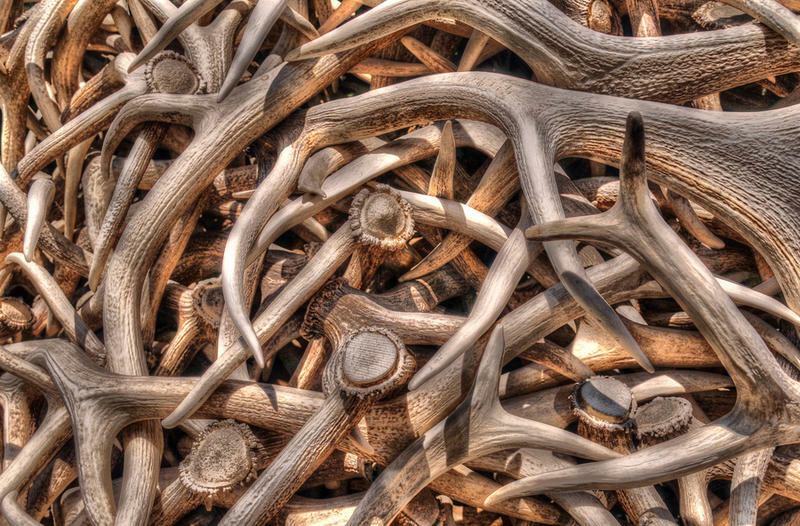 People drive away with 10,000 pounds of antlers. At $10 a pound, that’s $100,000 dollars worth of dog chews. I finally reach the winter range gate. In the pitch black, people on horseback and foot are making a run for the mountainsides—literally. It’s like an Easter egg hunt for grownups. The hills look like Las Vegas, spotlights, and flashlights squiggling everywhere. I invite myself along on an antler hunt with Casey Brian. He and his 16-year-old nephew drove 12 hours from Washington state to get here for this. “So what’s your strategy?” I ask. “Just go where no one else is going,” Bryan says and laughs. His other strategy is sweeping their flashlights over the sage brush for antler tines sticking up. I try to keep up, but soon Bryan and his nephew disappear into the dark. The next morning, I return to see how everybody did. Allison and his friends drove three hours from Montana. They found a spectacular deadhead. “What did you think when you saw it?” I ask. 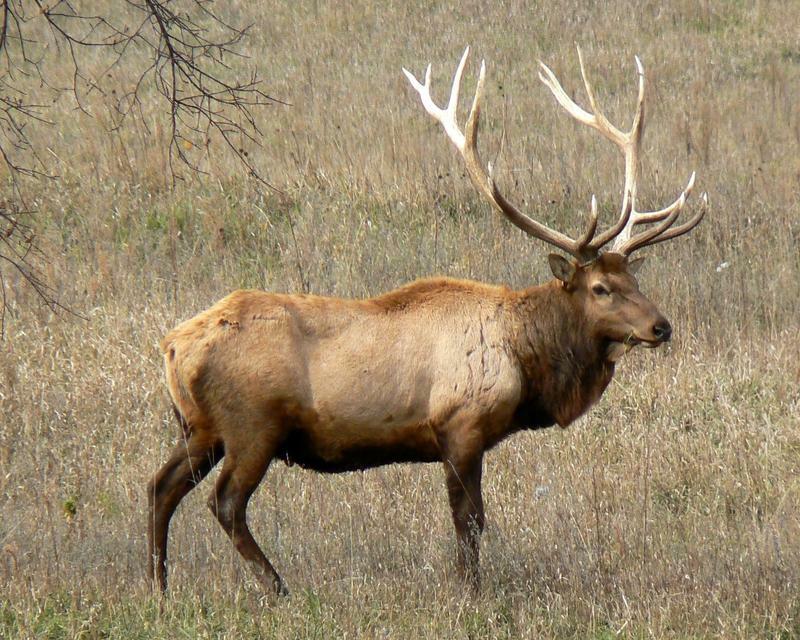 “Pulled it out of the ground, I was like, holy mackerel, that’s a pretty big elk. They might have as much as $1000 worth of antlers in their truck bed. “Do you guys plan on selling these? Or are they things you want to keep? “I’ll probably keep them this year,” Allison says and his friends all agree. They say it’s not about the money, it’s about the hunt. 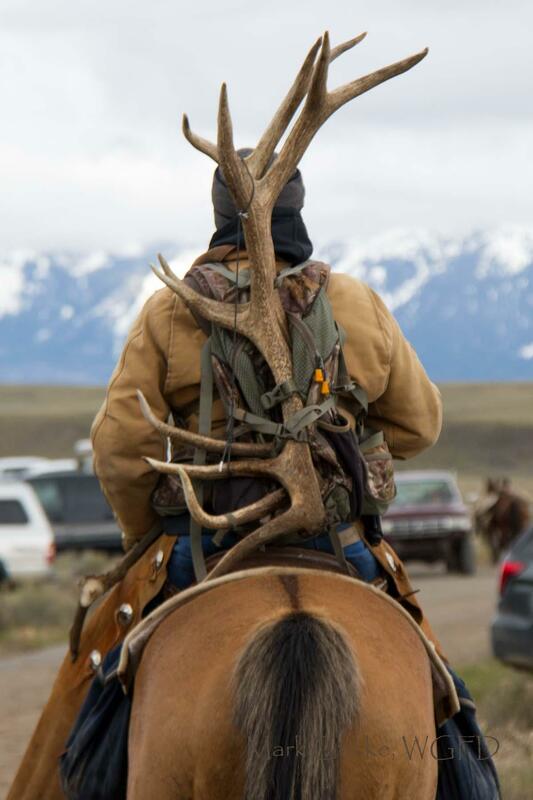 The Elk Refuge will host its 50th anniversary antler auction on the Jackson town square on May 20. 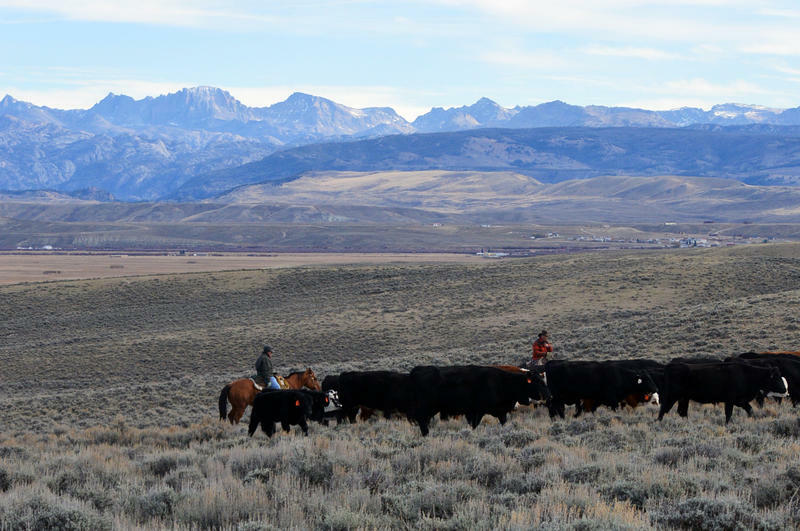 Many ranchers around the West are searching for a way to control a recent increase in livestock killed on the range. At the annual Wyoming Farm Bureau meeting this month, members supported a new policy they hope will address the problem. 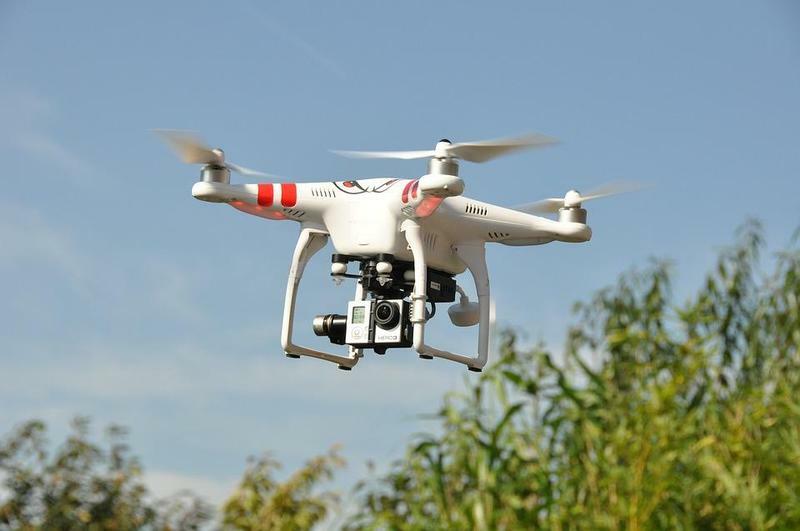 Farm Bureau spokesman Brett Moline said it’s not clear why people are shooting more livestock.